In February 1995, in a little known town called Coalville, a previously unknown new dance night was born. Dance legend Todd Terry was on the decks and it launched 14 years of clubbing history. Within three years all the biggest names wanted to play Passion in Coalville simply because of the unrivalled atmosphere. Tony De Vit, Boy George, Judge Jules, Danny Rampling, Seb Fontaine, Guy Ornadel, Ferry Corsten, Armin van Buuren, Paul Oakenfold, and Paul van Dyk have all made the pilgrimage. 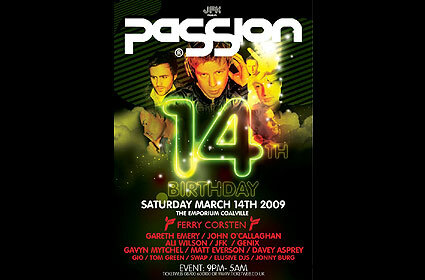 On Saturday 14 March Passion is having a birthday celebration with Ferry Corsten, Gareth Emery, John O�Callaghan, JFK, Genix, and Gavyn Mytchel on the decks. Early bird tickets are �12.50 + BF, savers �14 + BF, standard �16 + BF, and it will be more on the door. "Within the darkness a ray of hope was born, somewhere where like-minded people could unload at the weekend, express themselves and be reborn. This euphoria and release was called Passion."